Tamar Braxton has come a long way. Since 1989, Tamar has been fighting to make a name for herself in the music industry. So now, 24 years later, Tamar has a lot riding on the success of her album. And landing on the charts at #2 in its first week isn’t a bad way to start. Taking a lot of cues from divas like Beyoncé, Brandy, Tamia, and her big sis Toni Braxton, Tamar creates a solid album. The lyrical content is decent, even though her mumbling makes some of the lyrics indecipherable, and the production values are top-notch. I wouldn’t expect any Grammy nominations (save the smash title track “Love and War”), but the album shouldn’t be panned either. Love and War really is an apt title for the album. After giving it a number of spins, the album has a split personality. And if you are at all familiar with Tamar Braxton, you know that is pretty much how she is built also. All of the songs fall into one of these two categories: Modern Diva or Ratchet Princess. Let me explain. The Modern Diva side of Tamar is a powerhouse vocalist that produces soaring ballads and urban-leaning mid-tempo tracks. Unsure of what that means? Look no further than what I am calling the “Diva Suite”: “Stay and Fight,” “Love and War,” and “All the Way Home.” These tracks encapsulate what a diva at the top of her game looks like. Songs like these are where Tamar really shines. “Stay and Fight” is a strong contender for the next single with her tried and true vocal delivery and music production that is primed for radio crossover. “All the Way Home,” the current single, doesn’t get any points in the creativity department, but you can feel that Tamar is singing from experience. And that can make all the difference in a song. The title track, “Love and War,” was chosen well. It has the simplicity and power that garners wide acceptance. Outside of the “Diva Suite,” a few other songs really suit Tamar’s talents. “Pieces” has just enough attitude to make it distinct, and women all over the country will be feeling this. In short, it’s a Olivia Pope-ism in a song (“If you want me, earn me!”). 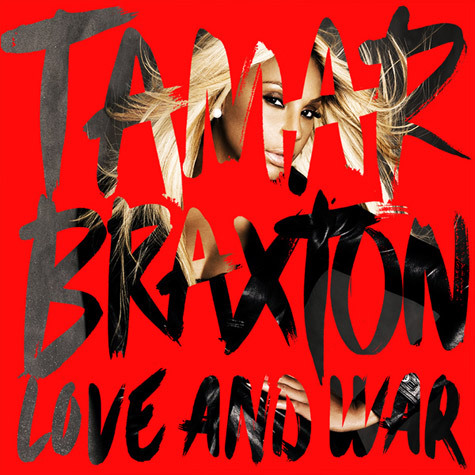 “White Candle”, aside from beautifully written lyrics, arguably contains Tamar’s best vocals of the album. As she pleads to keep her love alive, you can feel her urgency and sincerity. Just like almost every R&B album of the 90’s, the album closes out with a gospel track, “Thank You Lord.” But it is clear that Tamar didn’t include this track to meet some type of quota. She treats this song with as much care as any other song on the album, once again showing the vastness of her range. These three songs almost melt together into one song, due mostly to the first two tracks clocking in at under 2 minutes. On “One on One Fun,” Tamar is all about spending some time with her man. Her voice finds its most sultry tones and pretty much stays there. “She Did That” spins her Twitter phrase into a knocking refrain about her possessions. And “Hot Sugar” is about her man wanting her in the way. By far, “Hot Sugar” is the most successful of the three, evoking a revamped Adina Howard kind of vibe. Other ratchet gems are “Tip Toe”, in which Tamar cautions her lover to not let anybody see them together, and “Prettiest Girl”, where she brags on how good her man makes her feel. The direction that should really should have gone with all of these songs is similar to her second single “The One.” Sure, make a song club-friendly, but don’t be over-the-top with it. Keep it classy. Whitney Houston was known to be someone who you don’t mess with, but you never heard her singing about it. Your music isn’t only your personal outlet; it’s also a business. The two sides of Tamar are clearly on display here. And though she has claimed that her previous labels had control over her content, no one can deny that her hand is heavy here (even if her husband’s hand is just as evident). Love and War is not the type of album that you listen to from front to back. You go to certain songs based on your situation. Mad at an ex? Listen to “Pieces.” Headed to the club? Any song from the “Ratchet Suite” will suffice. Just feeling plain spoiled? “Prettiest Girl” is for you. Your girl Tamar has you covered from all angles. So, is Tamar taking music to a new place? No. Can’t say that anyone’s life will be any better or worse after listening to the album. But she has made the statement that she isn’t just a “doo wop pop” chick or reality TV fodder. She is a bona-fide artist, and she’s got the pipes to back it up.